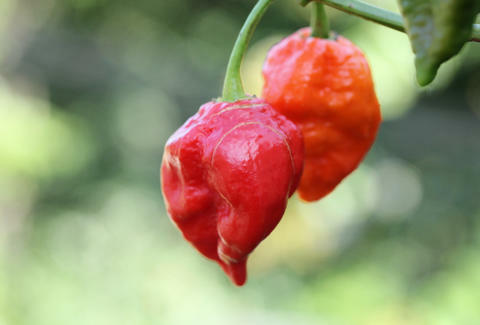 At over 1 million Scoville heat units, ghost peppers are one of the world's most vicious chilies. These mean little guys -- made famous by a rash of ill-advised daredevil stunt videos -- have been turning enthusiasts' insides into molten lava for years. But this outrageously powerful South Asian hybrid fruit (yes, peppers are a fruit), also known as Bhut jolokia in its native Assamese, might have finally found its kryptonite. Researchers are now experimenting with capsazepine, a groundbreaking synthetic chemical imbued with a neutralizing agent that prevents the pain you feel after wolfing down overly spicy food. It's basically a fake form of capsaicin, which is the naturally occurring irritant (aka destroyer of bodily senses) that makes chili peppers such killers. But instead of adding to the heat, this synthetic works as an antidote, disarming TRPV1, the pain receptor triggered by eating capsaicin. Basically, a dose of this sucker and you can stuff your mouth full of a pepper 10 times hotter than a habanero and 400 times hotter than Tabasco sauce without shedding a single tear. There are also a slew of health benefits linked to consuming capsaicin in relative moderation. Studies have shown that the chemical can aid in treating arthritis, skin conditions, and even prostate cancer prevention. But without capsazepine, the bad definitely outweighs the good -- nobody wants to risk burning a hole in their esophagus just to clear up a nasty bout of plaque psoriasis. As exciting as that sounds, capsazepine wasn't exactly made with hot-headed YouTubers in mind. The scientists behind the drug are hoping their creation could serve as an alternative to the many prescription pain medications that have been linked to a skyrocketing number of public health issues across the country. That's not to say that the yet-unreleased miracle cure is all rainbows and unicorns. Sure, it might keep you from feeling the burn going in, but since the chemical's effect only lasts for a limited amount of time, going out could be an entirely different story. When ghost peppers are involved, there are never any guarantees. Meredith Heil is a staff writer for Thrillist. She and Wil are like a mouth of ghost peppers. Black Ferrari with the red seats, she calls it playing checkers. Follow her @mereditto.